Whether you’re dogless or a proud doggy parent, we invite you to a very special event, as we learn to make delicious and nutritious doggie treats! Leading this demo class will be Mei-i Zien, dog chef extraordinaire, and Owner & Founder of maison de pawZ, a company specializing in Parisian-inspired gluten free, grain free + human grade dog biscuits. 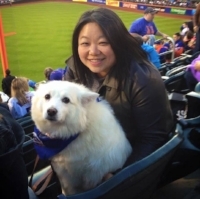 Mei-i will teach us the art of creating the perfect holiday doggie-pie, as each attendee gets the opportunity to make their own pie crust. Tying the experience together, this class will be held Boris and Horton, a dog-friendly cafe that is truly heaven on Earth. Expect to meet dogs of all sizes, breeds, and personalities! Your booking includes wine, a human pie tasting, a take-home of your own freshly baked dog pie, and recipes! Dog owners are more than welcome and encouraged to bring their pups. Mei-i launched masion de pawZ after becoming frustrated with the unnatural, hard-to-pronounce ingredients commonly found in dog food. During that time, her 7 year old, Tyler, a mini-American Eskimo, was suffering from skin allergies, and that the unhealthy dog food was of no way a help to Tyler. Using local + seasonal ingredients for her own food and for clients translated into the way she cooked/baked for Tyler. Taking her love of food + love of dogs, she took it one step further with the creation of maison de pawZ! maison de pawZ specializes in Parisian-inspired human grade, gluten and grain free dog treats and pawtisseries. Boris & Horton was created to provide New Yorkers with an amazing café and retail experience to enjoy alongside their dogs. Think of us as your neighborhood coffee shop that allows dogs and hosts adoption events, but unlike the city’s cat cafes, dogs don’t live here.